The Ageless Wisdom teaches, the macrocosm is reflected in the microcosm. If this is true, then we can better understand ourselves through understanding the nature of the universe in which we reside. To arrive at an overview of the universe, one must first expand their perspective. Let's take a guided journey through the cosmos in the hope of catching a glimpse of the Big Picture. Imagine yourself to be traveling through space at great speeds and suddenly, far away, an image appears. As you approach, you see what seems to be a transparent outline of a human figure floating in space, a gigantic being whose body encompasses many light years. Drawing closer, you now see its body is ethereal, made up of many sparkling points of light ~ you realise each point is a star. Drawing closer still, you recognise one of those starry points as the Sun. Catching a beam of light, the realm of the macrocosm is soon left behind as you travel inwards to the solar system, the relative microcosm, in order to understand how it all works. As we enter the solar system, we notice the planets receive light and energy in the form of particles given off by the Sun; negatively polarised to the Sun, they are on the receiving end of the energy flow. Obviously, the Sun is positive to all the planets as it radiates outward and receives little energy in return. But this does not mean the Sun is merely a transmitter of energy ~ it also receives, from sources outside the solar system. The positive-negative chain continues with Sirius, only 8.6 light years away, the next positive star on the outward swing. Our sun, clearly positive to its planets, is now negative to this great double star system. Because of its interesting composition, a white dwarf star married to a star with over double the mass of the Sun, Sirius packs a major punch energy-wise, with its magnetic field generating about one billion times the effect of our sun's. The lesser star, the Sun, receives energy from Sirius, thereby dynamic Sirius is positive to our sun and many other stars as well. Yet even mighty Sirius is negative to every star greater than itself, of which there are many ~ and each of them on the receiving end of even greater stars. The progression continues on and on, traversing the stellar level ultimately to include galaxies; the process remains the same, it just takes place on a larger scale. Again, less dynamic galaxies are negatively polarised to greater galaxies. This is the essence of polarity ~ the stars are interconnected to each other through their positive-negative hookups ~ each connection creating a flow of electrical current from star to star. Space is completely filled with these intersecting streams of stellar energy, linking up stars vast distances away, possibly even unifying all things contained within the interstellar medium. It is these streams of energy or lines of force that comprise the etheric body of the universe. The energy flows through the magnetic field lines, like blood through arteries in a cosmic vascular network, supplying the entire cosmos with life force or prana. Each star, planet and lesser life form receives what they require for life. Before his death Albert Einstein declared the electromagnetic field to be the ultimate entity of the universe. As one begins to tune into the etheric body of space, a beautiful image coalesces; the image of the light body of God, that same image we tuned into at the beginning of this article. No longer existing only in the realm of devotional mysticism, but grounded in scientific reality, this information bridges the highest thinking of both east and west to give us profund insight into the nature of God. Time to rethink your paradigm? Humanity is not separate and somehow living outside of this reality ... in fact, we are "created in God's image" or modeled after the great stellar entity in whom we reside. We are actually minature replicas of this gigantic being, although it's difficult to see the resemblance in our physical forms. If we look at it etherically, however, it's a perfect fit. It has seven chakra centers underlying its dense outer form, so do we ... although star groups comprise its energy centers. The signature wavelength, the essence itself of those same star groups, flows through our chakras, providing an intrinisic link to the heavenly bodies. Our human forms could not withstand these potent forces directly, so a series of stellar stepping-down mechanisms bears the brunt until sufficiently dissipated at the planetary level. 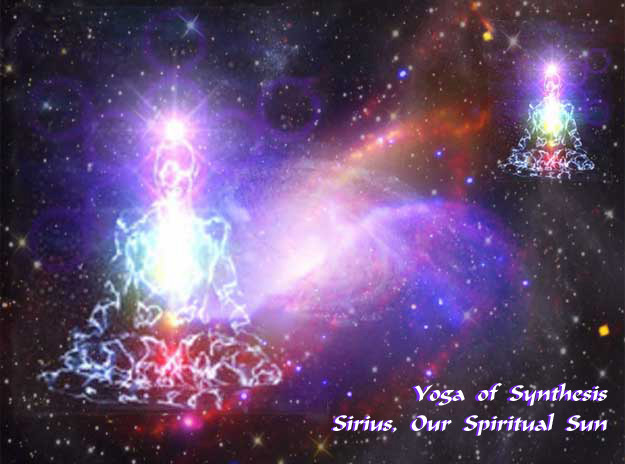 The planets themselves dispense the life-giving star essence through harmonic resonance with our chakras. While our chakra centers are in resonance with the planets, remember these are only at the receiving end of a long succession of transmitters stepping down the frequency of our heavenly hosts. Our planet's stellar heavyweights ~ the Big Dipper, the Pleiades, Sirius, etc. ~ transmit their light to us not directly, but via a corresponding zodiacal constellation which then downloads the force to its corresponding planet. The zodiac actually acts as a buffer between these radiation-packed streams of energy and the comparatively fragile life forms on Earth. This information is not new to humanity ~ in fact, as world religions reveal their pearls, it is apparent the picture of an interconnected cosmic web has been used extensively in the east to convey the mystical experience of nature. For the Hindus, Brahman is the unifying thread in the cosmic web, and the ultimate ground of all being. In Buddhism the image of a cosmic web plays an even greater role. The core of one of the main scriptures of Mahayana Buddhism is the description of the world as a perfect network of mutual relations, where all things and events interact with each other in an infinitely complicated way. The cosmic web plays a central role in Tantric Buddhism, in fact, the word tantra, whose Sanskrit root means "to weave," refers to the interwovenness and interdependence of all things and events. The conclusion modern physicists have arrived at from atomic physics research is essentially the same ~ that inseparable quantum interconnectedness of the whole universe is the fundamental reality. Remarkably, the ancients knew about "the web" without the benefit of modern scientific instrumentation. In fact, the left brain of humanity, the thinking logical part, is finally catching up after eons of time, with the right brain or intuitive side. Our ancestors did not develop their concepts using rational thought, they simply tuned in to what is. That same mechanism is available to all who employ it, with undoubtedly the same results. The entire universe is as close as your imagaination. Possibly the process of enlightenment can be summed up as simply attaining ever greater and larger awareness through identification or unity, with the next stellar field or positive point along the chain. We come from the stars and to the stars we return ... obviously, not in these dense physical bodies, but in our consciousness. In that high place stands revealed the glory of God.